If you miss the simplicity of sitting down with a blank sheet, some crayons or oil paint, and just peacing out from the real world for a few hours because you’re focusing on getting just the right shade of red on that sunset, join the club. We’ve rounded up four groups that allow supposed adults to paint, etch, sketch and generally create a mess that would make our mothers nostalgic. Go forth and don’t forget to colour outside the lines. 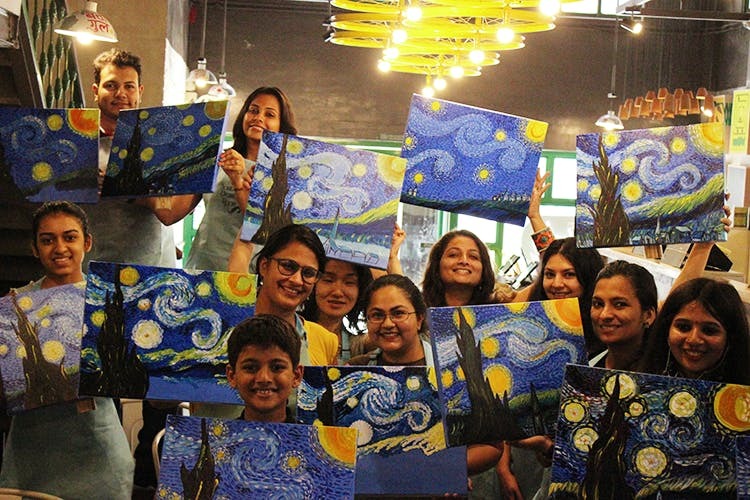 Established in November 2015, the Bombay Drawing Room holds weekly painting sessions across the city. These have been at cafes and restaurants such as Chaayos, JamJar and the Social bar and restaurant. Themes we loved included Van Gogh’s Starry Night and Paint A Haiku. The events include around 50 people on an average, and everything from supplies to snacks is included. Price: INR 1,500 upwards for a single session. We love both travel and art, so this one hits the sweet spot. The Travel of Art was begun in September 2015 as way for people to explore a location through the local art. So far, they have explored Pachgani, Pune and Arunachal Pradesh. The art forms have included charcoal, sketching, oil painting, and pottery. For when we’re short on leaves from work, they also hold workshops in Mumbai on a monthly basis. The Pomegranate Workshop is ideal for amateurs like us who still want to take art a little more seriously. They have both three-month-long courses which are held on a weekly basis every Saturday morning, as well as one-stop workshops held for three hours all across the city. Previous workshop themes have included the works of Georgia O’Keefe. The three-month-long courses can be chosen on the medium, which include charcoal, acrylic and oil. We’re also eying the art appreciation courses, which are scheduled to begin in July. Price: INR 2,000 upwards for a one-stop workshop. We love Blue Bulb for how their workshops step off the normal easel and paint context. Their workshops have included Japanese tie and dye, clay art and ceramic painting. They even had a ‘love’ special workshop back in February for Valentine’s Day. Their workshops are held on the weekend, and you’ll find them everywhere from Byculla Zoo to Dadar East. Blue Bulb also sells ‘Experience Vouchers’ for their workshops, which we’re planning to gift to the next person who says they have nothing to do in their free time.